Art-Hunger. November 17th 2012. 4pm-10pm. Fort Worth. Art. Food. Live Music. Inside the middle gallery, not only will there be walls lined with artwork, live DJ's will entertain you with a diverse group of genres as well as live MC's will be performing. Food and beverage trucks will be parked on the side for your convenience and to fulfill that dinner time appetite. 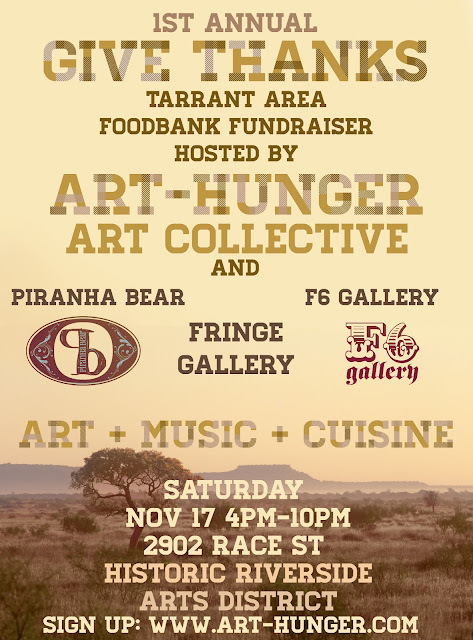 A graffiti wall will be available for anyone to express their inner artist. Public restrooms will be accessible inside all 3 of the galleries. This is a family event, everyone is welcome... even the dog! 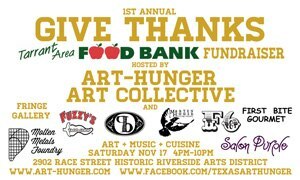 GIVE THANKS Annual Food Drive hosted by Art-Hunger made possible by great artists and wonderful sponsors. See the registration page to be part of this great event. and give thanks to all that is ART.